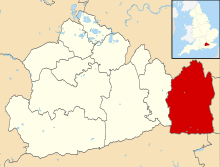 Farleigh is a village in the civil parish of Chelsham and Farleigh in the Tandridge District of Surrey, England. It is located in the North Downs AONB and the Metropolitan Green Belt, 4.5 miles (7.2 km) south east of Croydon, 13.4 miles (21.6 km) south of London and 25 miles (40 km) WNE of Surrey's county town, Guildford. 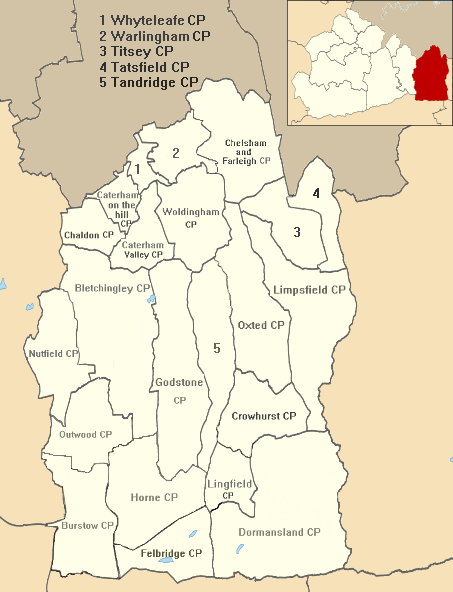 Farleigh lay within the Anglo-Saxon feudal division of Tandridge hundred. Farleigh appears in Domesday Book of 1086 as the manor of Ferlega. It was held by Robert de Wateville from Richard Fitz Gilbert (de Clare and de Tonbridge). Its domesday assets were: ½ hide; 2 ploughs, 1 ox, to its overlords per year rendering £3. Judging by the style of the western doorway of St Mary's Church, a date about the close of the 11th century is indicated, at least for the building of the first stone church. The present building is of field flints, with the original rough yellow plaster or mortar coat outside, and with dressings of local firestone and inside a little caen stone. In the 13th century the manor belonged to Walter de Merton, who founded Merton College, Oxford and settled his property in Farleigh upon the new society. The living is a discharged rectory which gives rise to chancel repair liability on the holders of Merton College's land. The church is on an elevated site, and consists of a body and chancel only, with no tower. Charles I in 1634 confirmed the rights of the manor with the advowson and certain woods called Farley Parks, Farley Frith, Popletwood and Hedgegroves. In 1848 area comprised 1,060 acres (430 ha), of which 690 acres (280 ha) were arable, 320 acres (130 ha) woodland, and the remainder pasture, statistics which are little changed today. By that time the tithes had been commuted for £177 4s, and the glebe consisted of 28.5 acres (11.5 ha). In 1911 Merton college continued to hold the manor. From 1965 to 1969 Farleigh was part of the London Borough of Croydon. Farleigh makes up the northern part of Chelsham and Farleigh civil parish, both villages are on the North Downs, an AONB and within the Green Belt Farleigh is 4.5 miles (7.2 km) south east of Croydon, 13.4 miles (21.6 km) south of London and 25 miles (40 km) WNE of Surrey's county town, Guildford. 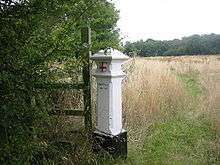 Together with Chelsham the total population of the civil parish was 356 as measured by the 2001 census. Farleigh lies high and commands views for a long distance with well wooded edges and the soil is most suited to pasture, including over London, from the centre of which it is visible from several locations, such as the golf course. The administrative centre of the district, Oxted is below the uplands upon which Farleigh lies, 4 miles (6.4 km) due south. The highest point of the North Downs, Botley Hill is a slight, gentle rise south of the Chelsham and Warlingham, which are on the same upland, along the straight road Croydon Road. Croydon Road afterwards veers east and descends the ridge to Westerham, Kent. Two of the seven parish councillors represent Farleigh and the clerk is Maureen Turner. Surrey County Council, headquartered in Kingston, elected every four years, has one representative of the area. David Hodge, leader of the county council is its representative as Chelsham and Farleigh are within the Surrey Council Council ward of Warlingham. Fickleshole is a hamlet and neighbourhood less than 1 mile (1.6 km) east of the bulk of homes in Farleigh. Fickleshole is mainly used for farming, with stables home to over eighty horses. Fickleshole was established in the early sixteenth century. As nearby New Addington to the northeast has been served by Tramlink, Fickleshole is relatively close to a good public transport system. Roads leading to the hamlet are very narrow with passing places, based on the old roads as used by horse and carts. Many of the roads are unsuitable for heavy goods vehicles. 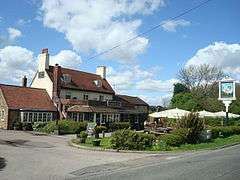 The White Bear public house, with its white bear sculpture outside, is the main landmark of the hamlet. St Mary's Church, the history of which is described above, is a Grade I listed building. It has a football club called Farleigh Rovers F.C. in Warlingham. Their ground is called Parsonage Field. They play in The Cherry Red Combined Counties Football League and are in the same league as Warlingham F.C..
1 2 3 4 H.E. Malden (editor) (1912). "Parishes: Farley". A History of the County of Surrey: Volume 4. Institute of Historical Research. Retrieved 7 November 2012. 1 2 3 Samuel Lewis (editor) (1848). "Farleigh, West - Farndish". A Topographical Dictionary of England. Institute of Historical Research. Retrieved 7 November 2012. ↑ "Hodge, Mr David". Surrey County Council. 10 November 2011. Retrieved 2 March 2012. 1 2 "Surrey's County councillors". Surrey County Council. 3 February 2012. Retrieved 2 March 2012. ↑ St Mary's Church, Farleigh - Grade I listing Historic England. "Details from listed building database (1377637)". National Heritage List for England. Wikimedia Commons has media related to Farleigh, Surrey. Wikimedia Commons has media related to Fickleshole. The administrative centre is Oxted. The largest town is Caterham. Three of the post towns have urban centres Caterham, Godstone and Oxted. Lingfield and Warlingham are major villages which have post town status. The others are outside the area.